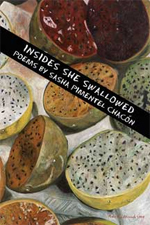 Sasha Pimental Chacón’s debut collection, Insides She Swallowed, brims with ripe, unusual images that linger long after each poem. She explains that the collection is based “on what we consume in order not be consumed ourselves”, and powerfully portrays these ideas with vivid, tangible examples of both physical and metaphorical consumption – recurrent images of life, of seeds and ripe fruit and blooming plants, of animals and the natural world, of the human body as both intimate and gross, in a constant celebration of beauty and biology. Chacón frequently uses present-tense verbs to evoke a sense of action, creating a quick pace that makes her pieces perfect to read aloud. Her sharp and precise language propels her poems forward. The first poem, “Learning to Eat”, opens with “A pomegranate / is opened like this: / gutted like a fish, / its entrails glow.” She doesn’t gloss over her images. The reader is presented with both the picturesque and the grotesque exactly as they are. The images may not always be beautiful, but they are always apt. What stands out is her ability to capture these images just at the moment at which they burst from their own confines and blossom into something beyond themselves. Her poems call to the senses: they feel like they can be touched, smelled, tasted. She uses a lot of color, especially brown skin that reminds the reader whose stories she tells and grounds the pieces in the reality of the Filipino American experience. The history and connection to working the land can be seen by frequent references to slaughtering animals at home, and in the third section of “Childhood Parts” she writes, “Seeing the brownness of our joints, did she / think of a wet chicken’s leg, how to pull / the limb from the socket, how easily.” Chacón carefully and intentionally selects images that are rooted in the very identities they portray. Many of the pieces in Insides She Swallowed meditate on the roles of family/community and of shared memories, taking advantage of the child’s perspective and childlike wonder to make observations that might otherwise remain unsaid. In “Bamboo” the speaker is able to share her mother’s grief over her dying grandfather and the way it brings them together to “ignore the twenty-one years we have held our emotions / like women, like bamboo cupping rainwater in a storm.” She captures the ways in which women often deny and suppress their own feelings as well as the ways in which those feelings may eventually spill over. But most of the poem is spent imagining what her mother might be thinking without talking about it, with lines such as “She counts the memories / she will never have because she moved West” and “My mother thinks of her father’s changing body, / how it breaks like a chicken’s wishbone / in the dampened handkerchief of his bed.” In this way, she shows the ways emotions are hidden and revealed within families. and this is hunger, this is hunger. Chacón has a powerful ability to convey meaning with little explication. Her poems are often personal, exploring the relationships within one’s family and community as well as how the Filipino American identity may be at odds with the traditional Filipino or American ones. She fearlessly paints the truth in its raw form, inundating the senses with a rapidity, grittiness and sensuality that, ultimately, leaves the reader satiated.